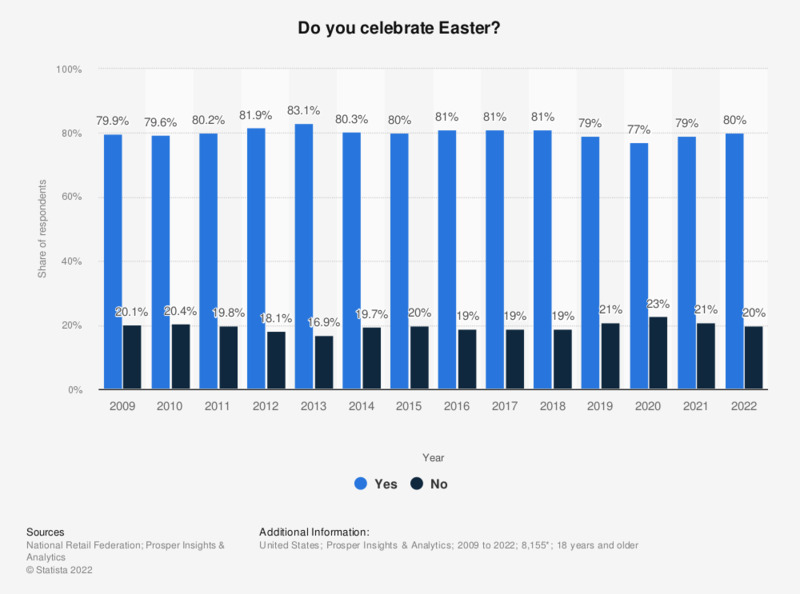 This statistic shows the results of an annual survey in the United States from 2007 to 2017 on whether the respondents celebrate Easter or not. In 2017, 81.3 percent of respondents stated they celebrate Easter while 18.7 percent of respondents stated they are not celebrating Easter. * Number of respondents for the March 2016 survey. Number of respondents varies each year. The source does not provide the information about how the survey was conducted. Have you planned a short holiday for the Easter period? Where will Poles spend Easter? What is the main reason for getting up earlier than usual? Was the beach you visited on your most recent beach holiday in another country than the one you live in?